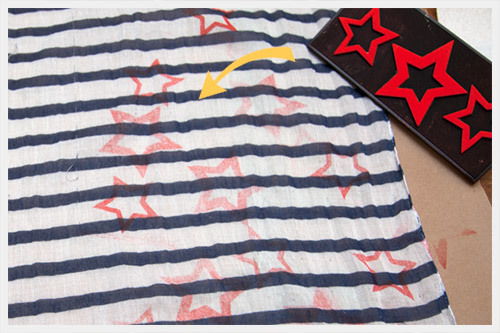 This slightly nautical DIY Stars and Stripes Scarf is a fun way to revitalize an old scarf and also get you ready for Memorial Weekend. There’s something so clean and fresh about a nautical look for clothes and accessories as we head into summer. 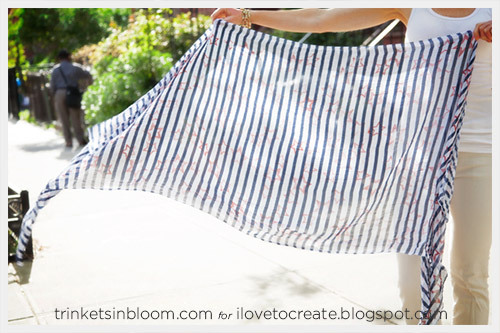 I love the crisp white and blue stripes on this scarf, but I wanted to add a subtle touch of red with stamped stars to add more dimension and interest. 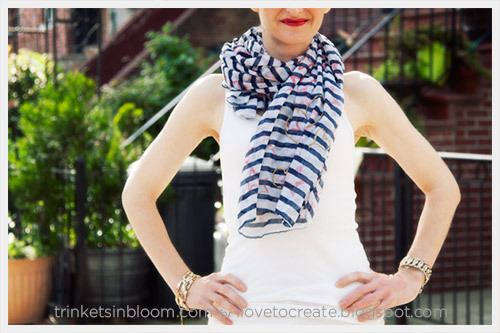 Layout your scarf on a large flat surface. I recommend putting some paper underneath your scarf just in case your ink or fabric paint bleeds through. Press your stamp firmly into your fabric ink pad, make sure you have ink on the entire design of your stamp then press your stamp firmly onto your scarf. 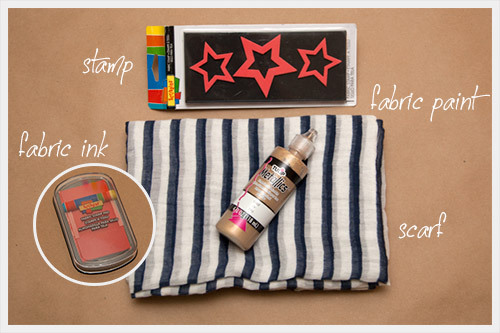 You will need to reload your stamp with ink each time you want to stamp it onto your fabric. As you go check the edges of your stamp for extra ink and clean it with a wet paper towel to keep it from ruining your design. TIP: To get really strong color with your Scribbles stamps you will need to make sure you have a lot of ink on your stamp and press firmly onto your fabric. The great thing about the Scribbles fabric ink and stamps is that it really stays on your fabric and doesn’t fade after washing. Also the inks have a very nice hand feel on your fabric. You hardly know they’re there, they’re never stiff or sticky. That’s why they’re perfect for a soft sheer scarf! 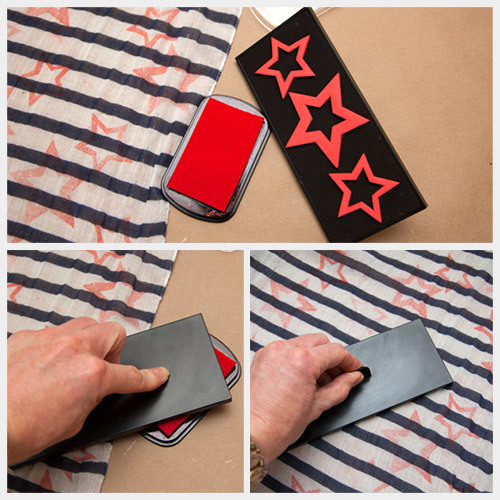 When you have finished stamping your design, you can add an extra touch with your fabric paint. 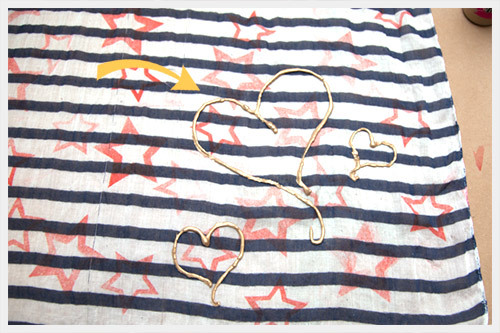 I painted 3 hearts onto a corner of my scarf. 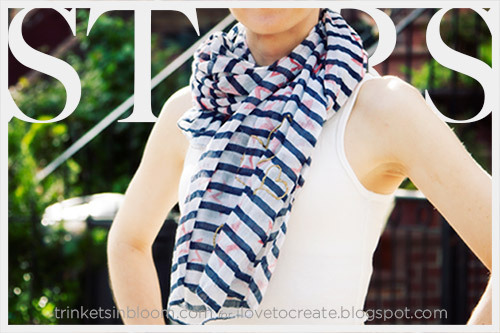 This can be a great finishing touch to your scarf, make it your signature! Be sure to let your scarf dry for a few hours or overnight to make sure all inks and paints are completely dry before washing or wearing. To see more DIY projects and tutorials by Trinkets in Bloom please click here.